The photograph above is a close-up of a starfish, encountered at Fairlight in Sydney last month. I’m pretty sure it’s a Mosaic Sea Star, Plectaster decanus. 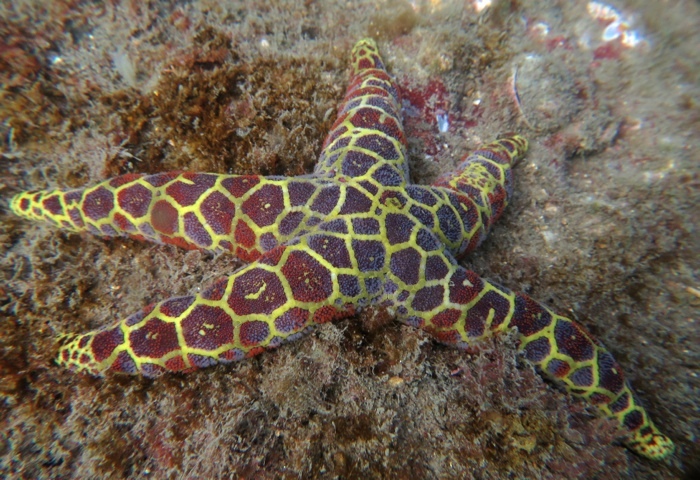 Reading about them, it seems the Mosaic Sea Star eats sponges, which would explain its presence in the sponge garden of my last post, and is one of the most poisonous starfish, probably as a result of chemicals ingested from the sponges. In this way it’s like some nudibranchs, with bright colors advertising inedibility and poisons deriving from a sponge diet. 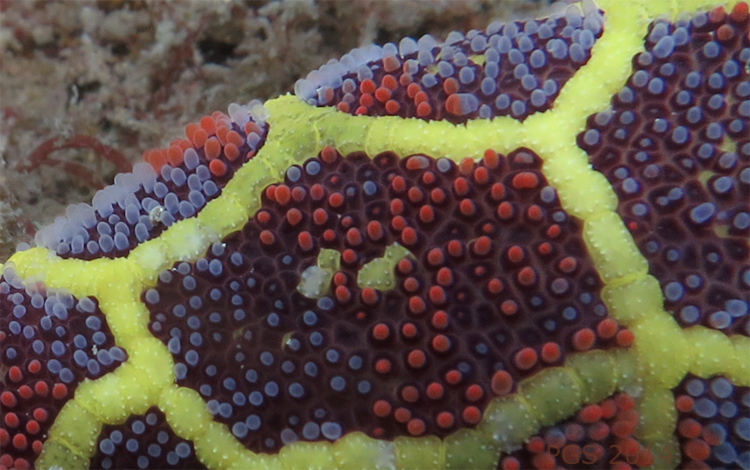 I don’t know whether, in this case or the nudi case, some of the colors themselves come from their sponges. Starfish are echinoderms – that’s their phylum, their basic group within the animals. At the end of this post I’ve marked their place on the tree of life. They’re closer to us than many of the other animals I’ve been writing about – closer than sponges, molluscs, and arthropods, though not closer than ascidians. They have nervous systems, in a “nerve net” organization. Each arm, like the arm of an octopus, seems to have some independence of action, and there are simple eyes on the end of each arm. Unlike an octopus, there’s no central brain to pull things together. This is a cluster of related properties including: (1) articulated and differentiated appendages; (2) many degrees of freedom of controlled motion; (3) distal senses (e.g., ‘‘true’’ eyes); (4) anatomical capability for active, distal-sense-guided mobility (fins, legs, jet propulsion, etc. ); and (5) anatomical capability for active object manipulation (e.g., chelipeds, hands, tentacles, mouth-parts with fine-motor control). Trestman says that out of all the many forms of animals that have evolved – perhaps 33 phyla, perhaps more – only three lineages, two phyla and a small part of another, evolved complex active bodies. These are arthropods (including insects, spiders, crabs), chordates (including us), and cephalopods, who are one branch within the molluscs. Trestman thinks that animals with CABs form a pretty definite and recognizable cluster, though CABs evolved independently a number of times. Complex nervous systems, and eventually minds, co-evolved with these special kinds of bodies. I’ve spent a lot of time thinking about cephalopod-chordate comparisons on this website and its predecessor; it’s interesting to add the arthropods and think about the trio that results. As Trestman says, arthropods were probably the first animals with bodies of this kind, arising in the early Cambrian, and their very presence may have then altered the evolution of other animals. Trestman’s categorization looks coarse, and you might also wonder whether it’s too impressionistic, but it is starting to look to me like a very useful idea. A question that comes to mind right away, then, is whether there is a gradient here, with a range of animals that have a partial CAB, to various degrees, or whether there is a pretty definite divide, at least among living forms, between animals with CABs and animals without them. Within the arthropods, cephalopods, and chordates, there are various animals with much simpler behaviors than others, so in that sense there’s certainly a gradient. But who are the most CAB-like animals outside Trestman’s trio of groups? Is there a sharp divide in that respect? If there’s a notable grey area among living animals, it might be seen in starfish. Trestman does not discuss echinoderms at all in his paper. I was once a bit startled, down at Octopolis, to see a large starfish moving at a visible and disconcerting rate over the sea floor; it led to a mild gestalt-switch in how I view them. Above I said that starfish “lead quiet lives,” but perhaps this is not so clear. 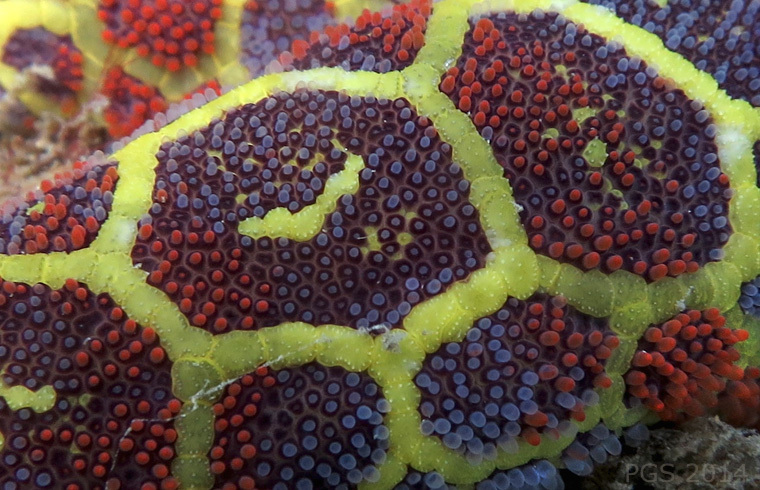 The web is full of videos of interesting behavior by starfish. These behaviors become visible, though, only when sped up, and the best videos are generally taken in time-lapse – a couple of classics are found here and here. I’ve started looking for the fastest and most complex behaviors known in this group. A website here says that one candidate for the starfish speed record (and hence the echinoderm speed record) is about 9 feet per minute. A video here has some complicated interaction that’s visible in a 3x speed-up. Even here, though, the behaviors amount, as far as I can tell, to a quicker and more complicated scramble than usual, and that’s all – it’s very far from the sort of thing seen in octopuses and insects. Trestman did not list speed, per se, in his description of the behaviors seen in CABs. He included “active, distal-sense-guided mobility,” but this leaves open whether the movement is fast or slow. Might there be CABs outside the familiar groups that are not obvious to us because their action occurs on a different time-scale? If so, does speed itself matter – is it part of what “complexity” and “activity” involve, in the senses that matter here, or is speed just an optional feature of a few cases? My first thought is that there might be quite an important relation between speed and other forms of complexity. Returning to Trestman’s list, the final and an important one is “active object manipulation” – using limbs and mouth-parts to do complicated things to other objects, transforming them in ways that go beyond mere demolition. This is a very notable feature of the behavior of complex chordates, arthropods, and cephalopods, and as far as I know, it’s only seen in the same organisms that can do things quickly. In response to this, it might be objected that I’m wrong to treat rapid behavioral manipulation using limbs as so different from chemical manipulation, which many slower-acting organisms have mastered instead. 3. A possible lost fourth origin of CABs that Trestman mentions is nectocaris. This might, on the other hand, be an early cephalopod. 4. An echinoderm website which compiles some time-lapse classics is here. This entry was posted in Arthropods, Cephalopods, Nervous Systems, Tree of Life and tagged echinoderm, starfish. Bookmark the permalink. Qualification of thought. Do starfish have articulated and differentiated appendages. They have 5 or more of the same appendage that are not differentiated from each other (but are distinctly separate). Does the plural definition mean multiple different or simply multiple? We have 5 fingers but at least three are different creating an ability to actively manipulate objects. Octopuses have 8 similar arms but there is growing acknowledgment that all may not be used for the same purpose and they have individual manipulating suckers as well as webbing (cuttlefish and squid have additional appendages. Cuttlefish have distinctly different arms as well as two tentacles). An additional thought about active object manipulation seems that excluding mating, locomotion and the act of eating or would be somewhat implied in the examples. Do chemo receptors fall inside or outside the distal senses? Lastly, time may be relevant to object manipulation in that slowly moving animals cannot effect a high degree of change on moving objects. Also, speed of movement needs definition of what kind of movement. Speed in a direction is separate from speed of an appendage. Serpent stars win hands down when it comes to arm movement as noted in the comments about observing them finding and lassoing food in real time (no time lapse needed). I suspect they would win in a crawl race (flat or vertical) as well since they use their full arm for locomotion and not tubular feet. I think they are supposed to fall outside that category, and chemoreception is one of the main examples of cases of that kind. One might have doubts about this, though; Lucia Jacobs at Berkeley has some interesting papers about the use of olfaction to map an animal’s environment. If there are two fixed sources of olfactory signals at different locations, then every point in the environment will have a unique olfactory signature. So it’s possible that people are underestimating the role of olfaction in how animals handle space. I was about to write that echinoderms only have very simple vision, and then noted this page. 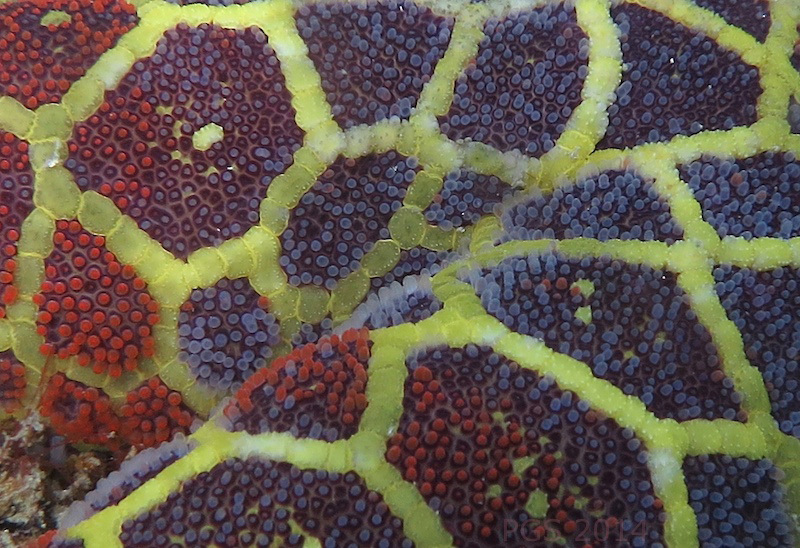 This is about brittle stars, which some other comments above have talked about. These seem to also be the best cases of echinoderms with CAB-like appendages. Serpent/brittle stars definitely have the physical ability to manipulate their arms with more dexterity than our fingers and use them in a CAB like manner but I am still unclear if the classification intent requires multiple types of appendages or multiple appendages that can be of the same type. The more I read about biological evolution, the more I think we cannot simplify or even group based on a fixed set of features. I suspect we need classifications based upon some set or subset of activated genes and animals will fall in multiple active gene classes. I suspect our insistence on trying to group things has to do with a desire to see design where there is none. I suspect that Trestman meant by ‘differentiated’ appendages a situation where the animal has different kinds of appendage, specialized for somewhat different roles. And then octopuses fit this category less well, because their appendages are not very differentiated (only a little). When Trestman talks of a ‘cluster’ of properties in his definition, I think he means that in different cases an animal might have most but not not all of these features, or might have some to a greater degree and others to a lesser degree. Still, the case of octopuses makes me think that his first feature, “articulated and differentiated appendages,” is less important than the others, because octopuses don’t seem to sacrifice much by having little differentiation of arms. I vote that Trestman’s Complex Active Bodies draws a useful distinction between types of animals across phyla. I have a similar distinction in my life: “creatures to watch out for because they can watch out for me.” I do think it’s useful and not merely species-ist to care about timescale and sensory complexity — for example, I feel very grateful that I can outrun these echinoderms. What I worry about speed- and vision-wise are spiders. Ever since I watched Attenborough’s Life in the Undergrowth, and read the spider chapter in Complex Worlds from Simpler Nervous Systems. I still have nightmares about the spider who lures other spiders in for the kill by pretending to be their prey. Or the spider who walks around with a web net between its arms and then wham!. Anything that has developed meaningfully inter- or intra-species sensory capability is something I need to watch out for, because I may be added to their friend, foe, or food list. What’s the most spider-like thing that lives in the ocean? Would it be crabs? That doesn’t seem right. I want to know what uses tools for hunting (as strong and repurposable as silk) and is diabolical (endlessly diverse hunting methods on both other members of its own species and other species). Then I will WATCH OUT for such creatures. Pretty interesting stuff, it makes me want to dive into the invertebrate cognition literature. A few thoughts off the top of my head. When looking at complex behavior in marine invertebrates it might end up being very important to consider the larval stages. Larval stages are often radically different from adult stages, and there might be some hidden insights there for the evolution of complex behavior. For example, I am guessing that the behavioral and sensory capabilities of a larval tunicate are much greater than that of an adult tunicate. There might be some polychaetes that would also come close to meeting the CAB criteria, adding annelids to the list. Look at the Eunice genus, or “bobbit” worms. And I don’t know how high the bar is for object manipulation, but pedicellariae are fairly complex appendages (and they operate entirely independent from the main nervous system!). Tripneustes sp., “collector urchins”, gather and hold onto shells, debris, and seaweed. It is thought that they might do it for camouflage or for blocking the sun, since many live in very shallow environments. And some relatively complex behavior can be seen in my favorite group, the sea cucumbers. They can search for, grab, and retrieve food using their oral tentacles. The comical video below has some good footage of oral tentacle manipulation and other behaviors. The most compelling (and alarming) case among these for me is the Bobbit Worm (Eunice aphroditois). “one candidate for the starfish speed record (and hence the echinoderm speed record)” Aren’t brittle stars faster and more active? I am still learning about these animals, and I’d welcome corrections on all these points. Having another look on the web, though, it does seem that the sand star mentioned on that page, Luidia ciliaris, might be faster than brittle stars, at least in a straight line. Here is a website (another page of the Echino-focused blog I linked to above, Echinoblog.blogspot.com) which has some detailed comparisons and more videos. Brittle stars might indeed be more active in other ways. I posted a comment at Echinoblog asking about brittle star speed. I remember from Invert Bio lab that it was fun to watch them (in real time) quickly descend on food that was dropped into the tank. Chris Mah at Echinoblog says, “It’s generally harder to measure two different taxa for speed. Starfish have a coordinated tube foot wave motion vs. brittle stars which mainly scuttle across the bottom. I would say that brittle stars are slower on the whole though.” So maybe ‘scuttling’ just looks more active!